There are two aspects to practice. The first is that you work on something so that you can play it well the very next time you play it during this practice session. If you succeed at this, and you do actually play it correctly, you are having a good practice. What turns the good practice into a great practice is making the correction so that you can play it well the next time . . . then you make a mental note of what you did so that you don't make the same mistake next practice session, and all those afterwards. This is a great practice reminder. 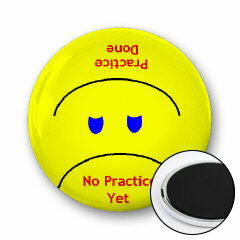 A refrigerator magnet that frowns before practice, but when you have finished practice you get to twist the magnet around. Move your mouse over the picture to see what happens! Practice Done! And the frown turns into a smile. Good motivator for young students! And it's under $4 at our CafePress Shop!